George Graham Reviews Keb' Mo's "Just Like You"
One of the tenets of the blues is that maturity is one of the keys to playing the style with the proper authenticity. From time to time there comes along some hot young performer in his teen or early twenties who is considered some kind of prodigy. But usually the acclaim comes from instrumental virtuosity, especially on the guitar. As far as singing the blues -- the best interpreters are those who have been around for quite a while. Two years ago, there appeared a seeming debut album by a previously unknown artist who promptly received great acclaim, and won a W.C. Handy award. The record dipped into the acoustic delta and country blues tradition for its main influence. It was by a fellow who went by the name Keb' Mo'. The record was remarkably successful for a mostly acoustic blues recording, and many observed a similarity to the early work of another artist with a nom de blues, Taj Mahal. Now Keb' Mo' is out with his followup record, called Just Like You, and by now, information about the artist has become more available. It turns out that he has been around for a while, and that his bluesy authenticity is the product of a lengthy career. Keb' Mo' is as some might suspect, actually named Kevin Moore, who grew up in South Central Los Angeles of parents who were from Louisiana and Texas. As in the case of many of the veteran blues artists, the church provided an early introduction to music and a profound and long-lasting influence. But Moore was also steeped in the rock and soul of the 1960s. By the early 1970s, he was enlisted by the late blues and jazz violinist Papa John Creach, who had just come off a stint with the Jefferson Airplane and Hot Tuna. Moore recorded with Creach in 1974. He also worked as a staff composer and demo producer for a music publishing company, and became part of the house band in a club in Los Angeles that hosted a lot of the great bluesmen including Big Joe Turner, Albert Collins, and Jimmy Witherspoon. In 1983 he released his first solo album, entitled Rainmaker on a label that soon folded. What kindled his interest in the Delta style blues was stint in theater, being offered the part of a bluesman in a 1990 production of Rabbit Foot by the Los Angeles Theater Center. In preparation for the part, he plunged into historic blues recordings and soon found himself enchanted by the people who defined the music's early direction. He decided to adopt the name Keb' Mo' after a friend and musical colleague started calling him that when he was asked to play the blues. But Keb' Mo's wide-ranging background made him more than just a strict revivalist of traditional style blues. For one thing, he is a prolific songwriter, and for another, he isn't bothered by dabbling with other genres. Again, I find a parallel to the work of Taj Mahal, who can be as authentic as anyone, but is not content to play just one style. Just Like You, the new Keb' Mo' album runs even further afield, and alternates acoustic blues with downright pop songs, and even has guest vocal slots by Bonnie Raitt and Jackson Browne. It seems designed to widen Keb' Mo's appeal, but it will likely leave blues purists a bit cold. And even when he does play what is ostensibly the blues style, his songs are not exactly standard blues pieces in form. They often have more complex chored changes than the traditional blues model. Still, if you accept that fact this isn't a strict blues album, and doesn't pretend to be one, it makes for first-rate listening. Keb' Mo' is a fine singer, and this album proves he is no slouch on guitar, not just on acoustic guitar, but playing some tasty licks on lead electric guitar. On the pop songs, one can be excused for noting a similarity to Bonnie Raitt's music. The rhythm section on Just Like You spent several years with Ms. Raitt. Drummer Ricky Fataar and bassist James "Hutch" Hutchinson are heard on the full-band tracks, along with keyboard man Tommy Eyre. In addition to the guest background vocals by Ms. Raitt and Jackson Browne on one tune, several of the other tracks have backing singers, ranging in style from a gospel chorus to a sounding like a big R&B production. John Porter, who produced Keb' Mo's first album again handles this record, and I think, does go a tad overboard on the more pop-oriented tracks. Keb' Mo's new release Just Like You is by no means a strict blues record, and those who might be looking for another purely authentic Delta-style blues collection from this New Orleans-based performer might well be disappointed. But Kevin Moore is a artist whose interests and experience range widely, from playing electric blues-rock with Papa John Creach, to writing pop songs for a music publisher, to being a student of the traditional blues. About a third the album qualifies as pop music, with the rest a mixture of the fine acoustic pieces and more electrified blues and R&B. Sometimes the album leans a bit too far toward the pop side than I would like. Although Bonnie Raitt and Jackson Brown are outstanding artists, their appearance on one song seems more a marketing than an artistic decision. But even the more outright pop tracks are handled tastefully. The backing musicians are all first-rate, and Keb' Mo' himself sounds great as a soulful pop singer. But it is on the acoustic blues that this album reaches its highest levels, with the performer making some very fine music by himself, drawing on his personable vocals, fine guitar work, and a style that updates the Delta blues tradition. Sonically, the album is also tastefully done with good clarity in the mix and a fairly decent dynamic range. From a production standpoint, I would have brought in the background vocalists less often. The production style brings up the old art versus accessibility argument -- I would rather more traditional style music, but the pop-oriented songs might draw in a new audience for Keb' Mo' who might never otherwise have been interested in Delta Blues, who would then be led to discover the style through listening to the tracks between the album's pop songs. 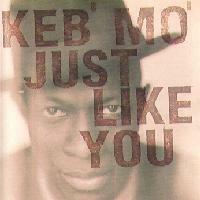 Artistic compromise or not, Keb' Mo's new album Just For You, is an enjoyable work by a very versatile performer.